"The hotel is still very new with relaxing ambience." "Great and absolutely re-visit next time"
"We booked a 2 bedroom suites on the 27th floor, the view is very nice." 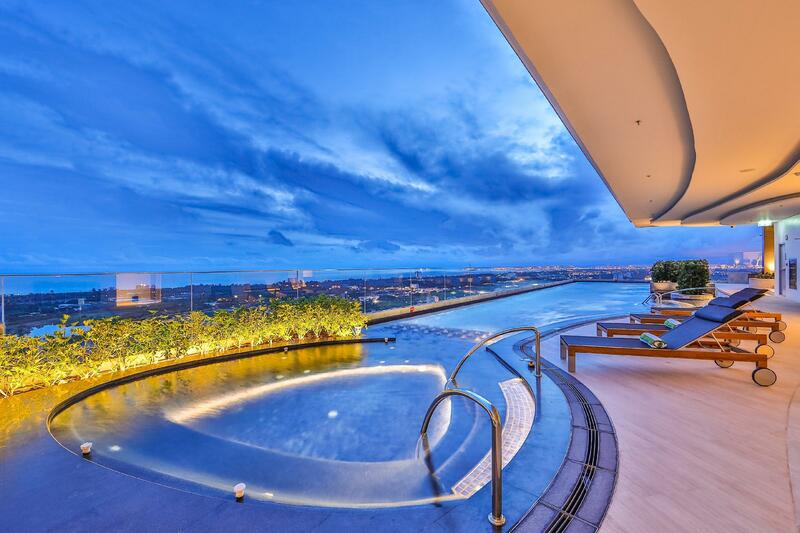 "The swimming pool on the 29th floor is amazing!!" "Room is nice and clean." 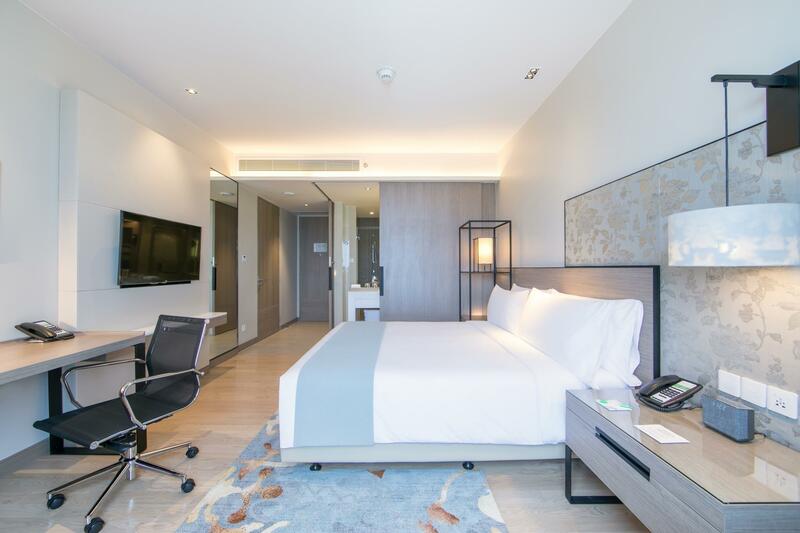 Well-placed in the shopping, business area of Rayong city, Holiday Inn & Suites Rayong City Centre provides a most conducive spot for you to take a break from your busy days. From here, guests can make the most of all that the lively city has to offer. With its convenient location, the property offers easy access to the city's must-see destinations. 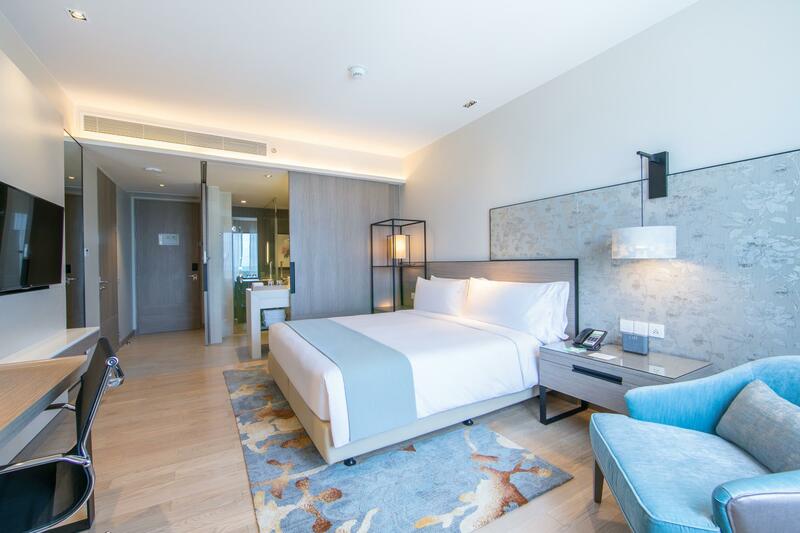 Offering guests superior services and a broad range of amenities, Holiday Inn & Suites Rayong City Centre is committed to ensuring that your stay is as comfortable as possible. Facilities like free Wi-Fi in all rooms, 24-hour room service, 24-hour security, daily housekeeping, 24-hour front desk are readily available for the convenience of each guest. The property features 288 beautifully appointed guestrooms, many of which include smoking policy – non-smoking available, smoking policy – smoking available. The property's outdoor pool are ideal places to relax and unwind after a busy day. 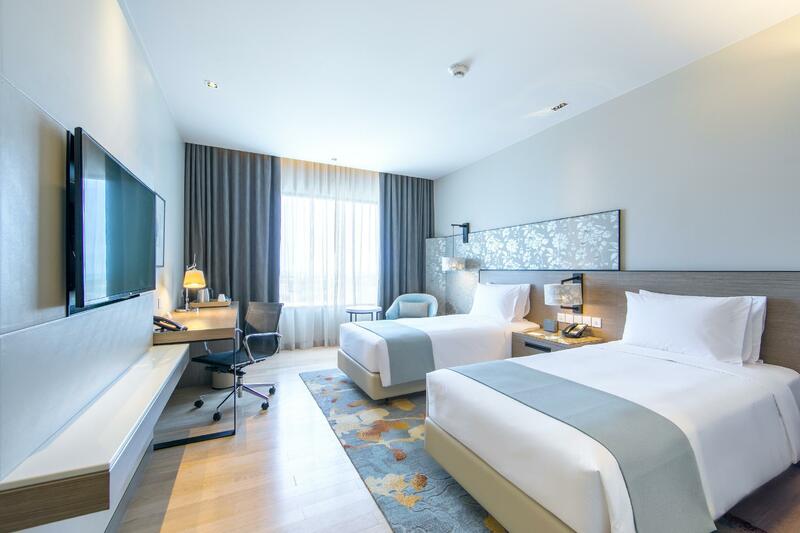 Holiday Inn & Suites Rayong City Centre is an ideal place of stay for travelers seeking charm, comfort, and convenience in Rayong. "Enjoy the breakfast as it is free for kids!" Excellent hotel, freindly helpful staff. Food in the restraunts was first class. Only downside was it was very windy when we visited the pool, located on the 29th floor. The weather not the fault of the hotel but made our swim a little chilly. But we will return when we are next in Rayong, overall the hotel is excellent. We booked a 2 bedroom suites on the 27th floor, the view is very nice. It would be nicer if we could face the sea cuz we saw how good it is from the executive lounge. Staff are friendly and helpful, we were wondering where we could go at night and they recommended the night market, it's not as good as other night markets in Thai but we could spend a good 2 hours around. The swimming pool on the 29th floor is amazing!! Breakfast was fine but could be better. The hotel is still very new with relaxing ambience. Located in city center next to Passione mall and not too far to drive to the beach. Staffs are very helpful and friendly. We were having great stay here! Had a great time and enjoyed the peacefulness and ambience of the hotel. Will definitely be back again. This is a great hotel with great services. hotel is stretigically located next to the mall. staff were excellent. The hotel is new and modern. The room is clean and tidy. The breakfast is variety and the staff are friendly. The hotel locates in the center of Rayong city. And it is the next door of the shopping mall. Nice hotel, brand new! Beautiful restaurant on rooftop, Italian food only, I wish they offer Thai food there too. The breakfast buffet is very good and variety. The lunch buffet is ok but seemed to be lacking variety. The dinner buffet is expensive and disappointing. The bbq meat over cooked very dry. The seafood is good though. One problem I had was that the chef did not give us any tools to crack the shells of crab and shrimp open to eat the meat inside. So we had to send it back to them so they can open it for us. They should do this automatically and bring us the shrimp and crap already open so we can easily eat the meat warm. The dinner buffet is the worse of the 3 buffets in my opinion. I would not recommend the dinner buffet and will not eat the dinner buffet again on future visits. No toilet in gym and no sauna. Couple chefs were rude when we asked them questions about food like they were angry to explain things to us and even laughed when we walked away.....wierd. I am a frequent traveler to Rayong. I stay here a couple times. I stay at this hotel only when the hotel next door, Dvaree, is full. Parking ramp is dangerous. There are a lot of lights flashing in the room at night. In-room router under the desk flash with bright multi-color lights. Lights from two phones are flashing even without any voice mails. Light from alarm clock and AC remote glow in the dark. I had to get out of bed and coverall the lights and it took stressful 15 minutes to do it. Not resting well. Two drain Flies are in the room both bathroom and on the bed. Very disgusting. Some front desk officers are inefficient and rude. Eve told me she could look up my IHG number if I gave her my email. Took over 5 minutes but could not find it. She processed my credit card twice before checking in! One to pay for the room and another to block an extra amount in case I (sneak in to) eat breakfast, she said! The hotel is located at the center of Rayong city and next to Passionate Shopping Mall which made it so much convenience for staying. Nearby there is also local food market (evening). Facilities are new and well maintenance. Very nice hotel, right next to a big shopping mall in the heart of the city. We were suppose to be able to check in at 3pm but the room was not available untill 4:40pm. Staff at the reception don't even tough to apologize or offer anything for the inconvenience. 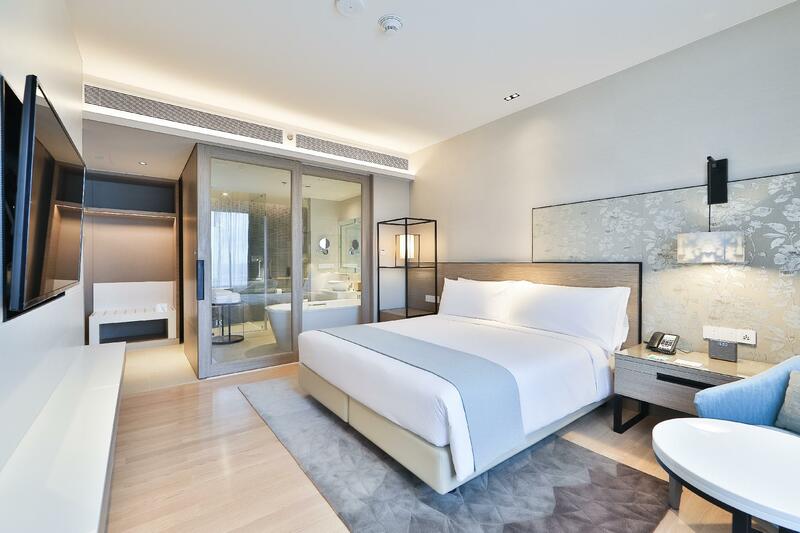 Beside this room are spacious, clean and bed is super comfortable. For a hotel of this size and rating the lobby is totally empty. Elderly guests who checked in have to stand. The lobby is so empty and soulless. No welcome drink gesture. Maid did not remove trash left over by previous guest. We had to phone the reception for it to be removed. Breakfast presentation is good but of poor taste. I stayed only 2 nights ,staff are friendly ,generous and helpful. The room is quite spacious and clean. The BF was good with varieties of Asian and western cuisines. Good location , just next to big Department store. Enjoy the breakfast as it is free for kids! very new hotel in Rayong with nice facilities like roof top swimming pool. But hotel staff services need to be improved.